As Myanmar readies to launch a pilot of its first national census in three decades on 30 March, activists and experts cite a number of challenges ahead of the actual count in 2014. At the time of the last official census on 31 March 1983, the population of Myanmar was 35,442,972. Current estimates put today’s figure at well over 60 million, including 135 recognized ethnic groups. In addition to requiring access to conflict-affected areas of the country, census organizers must also work at overcoming some residents’ longstanding distrust of the state; and there could also be funding problems, activists say. In northern Kachin State, which borders China, the government and the Kachin Independence Army (KIA), which has been fighting for greater autonomy for the past six decades, resumed fighting in June 2011 following the collapse of a 17-year ceasefire. According to recent estimates by the UN Office for the Coordination of Humanitarian Assistance (OCHA), over 80,000 people have been displaced by conflict in Kachin and Shan states. A recent report by human rights investigator Tomas Ojea Quintana to the UN Human Rights Council cited continued allegations in Kachin of "attacks against civilian populations, extrajudicial killings, sexual and gender-based violence, arbitrary arrest and detention, as well as torture". Meanwhile, in western Rakhine State (also known as Arakan), communal violence between Rohingya Muslims and ethnic (mainly Buddhist) Rakhine that erupted almost nine months ago and again last October, has left more than 115,000 displaced, according to Burmese government estimates. Some 800,000 Rohingya, an ethnic, linguistic and Muslim minority, live in Rakhine State; they are de jure stateless under Burmese law. They have long lacked decent health care, social services and education, and faced state-sanctioned persecution, including targeted restrictions (like family size) and requirements such as unpaid forced labour for security forces, according to activists. Burmese authorities consider them undocumented immigrants and do not recognize them as citizens or as an ethnic group. The country’s last two official censuses in 1973 and 1983 did not list them as part of the population. 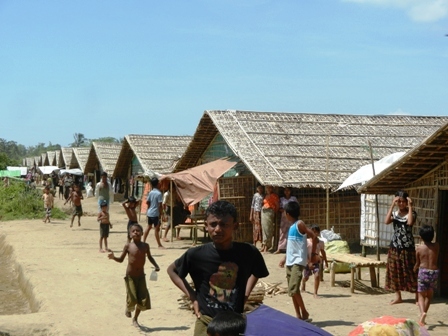 The government includes the Rohingya in official family registries and gives them temporary registration cards. However, such documents do not mention place of birth and are not considered as evidence of birth in Myanmar. But Nyi Nyi, deputy director of the Department of Population, the government agency carrying out the census, was clear the census is about numbers alone, sending IRIN a presentation that indicated everyone within the country’s borders on census night - 29 March 2014 - will be counted, whether or not they are a citizen. The only people to be excluded from the count are staff from foreign embassies and consulates. “This is major step for our country and will allow us to better determine development programmes for our country,” said Nyi Nyi. The census is not intended to determine anyone’s legal status, said Lin Yanming, acting officer-in-charge of the UN Population Fund (UNFPA) office in Myanmar, which is working with the government to conduct the census. Yanming added that the census will help monitor the country’s progress on reaching Millennium Development Goals as well as provide baseline indicators for the post-2015 sustainable development goals, which are yet to be set. Key challenges include lack of expertise as most of the civil servants who worked on the 1973 and 1983 censuses are now retired; little awareness among the population about the census; and reaching areas with ongoing fighting. In Karen State where armed groups have been at war with the government for more than 60 years and hundreds of thousands remain internally displaced, community workers say residents have almost no knowledge of the census, but also worry about possible abuses. “A census is not inherently bad, but, due to our past experiences working with the villagers, local military officers could use the population numbers to carry out abuses - such as arbitrary taxation and forced labour,” said Saw Albert, field director of the Karen Human Rights Group (KHRG). “When the government has more information about villagers, it is easy for them to target them,” he added. Another concern is that the census can be used as a tool to manipulate the numbers of people who support the ruling party, the Union Solidarity and Development Party, in the scheduled 2015 parliamentary election. “What we see of the villagers’ situation in our research area [all of Karen State plus parts of Mon State, Bago Division and Tanintharyi Division in southern Myanmar] is that they never have a chance to vote for the government. Usually they are not allow[ed] to vote in their own name, but are automatically assigned a vote without their acknowledgement,” said Saw Albert. At the other end of the country, reaching indigenous populations in the country’s northern Shan State bordering China, as well as other border communities, is a “major logistical challenge”, added HRW’s Mathieson, noting that few people in the mountainous, isolated regions even speak Burmese, the language in which the census will be conducted. The estimated total cost of the census is US$58.5 million, of which the Burmese Government and UNFPA have committed $20 million. The pilot census, ahead of the 2014 nationwide census, is scheduled in 20 of the country’s 330 townships from 30 March to 10 April 2013 and involves face-to-face interviews and some 41 questions. Preliminary findings from the nationwide count next year are expected in July 2014, with final results in early 2015.